We found a treasure along the Kwazulu-Natal Coast! We had looked forward to our first visit to Umlalazi Nature Reserve in March with great excitement, but what we found at this little jewel exceeded our expectations many times over. Compared to many other South African conservation areas, Umlalazi is tiny. The reserve may cover only a little over 1000ha, but it is the amazing diversity of ecosystems it protects that make it such a valuable piece of land. The estuary of the Mlalazi River is considered among the top 20 most important to conserve of more than 250 South African estuaries. Another watercourse, the Siyayi, runs parallel to the sea for a distance of about 8km through the reserve, though only reaches the ocean after episodes of extreme rainfall as its mouth has been blocked by the dunes at Umlalazi’s main beach. The reserve is well known for the excellent examples of mangrove forests it protects, but you’ll also find swamp forests dominated by Swamp Fig trees (Ficus trichopoda), climax dune forests, Acacia thickets, tidal salt marshes, freshwater wetlands, coastal grasslands, seashore dune vegetation as well as miles of unspoiled beaches. A grove of Kosi Palms (Raphia australis), one of the largest species of palm in the world, was planted in 1903 by a magistrate C.C. Foxon and is today regarded a national monument. A beach that stretches for many miles! Of course, with such a huge diversity of habitats it should come as no surprise that Umlalazi is home to an equally impressive variety of animal life. The abundance of invertebrate species of all descriptions is simply astounding. Thirteen mammal species have been recorded, with plains zebra, red duiker and vervet monkey being the most easily seen. The critically endangered Pickersgill’s Reed Frog is among 15 species of amphibians found in the reserve, while nile crocodile, python and gaboon adder feature in the list of 16 reptile species – 9 of which snakes – you might encounter. With a list of 327 bird species identified, the reserve is a prime destination for birdwatchers – pride of place of course going to the southern most breeding population of Palmnut Vultures that feed and nest in the Kosi Palms. These small vultures (wingspan of 1.5m, weight up to 1.8kg) is one of South Africa’s rarest birds, but regularly encountered here at Umlalazi, and apart from the fruit of the palms will also feed on carrion and small animals. In upcoming posts, we’ll focus some more attention on Umlalazi’s mangroves, the estuary, the forests and the beach. The focus for Umlalazi’s human visitors is on outdoor recreation, with fishing, boating, canoeing (can be hired at reception), hiking, birding, swimming, surfing and picnicking being popular pursuits. Excellent information displays at the trail heads and other public areas give visitors an insight into the world they are exploring. The reserve is managed by Ezemvelo KZN Wildlife, through whom overnight visitors can also book the twelve fully self-contained 4-sleeper log cabins, the 14 camping sites at Indaba Camp or the 36 camping sites at Inkwazi Camp available inside the reserve. The town of Mtunzini, just outside the reserve gates, also offers several alternative accommodation options, as well as a variety of other services you’d expect in a small holiday town. The area’s modern history dates back to the 1850’s when the colourful character John Robert Dunn settled here. Dunn befriended Zulu King Cetshwayo who appointed him Chieftain over the area that Umlalazi and Mtunzini lies in today. He held his court and celebrations under a large red milkwood tree (known as the Indaba Tree) in what is now the Indaba campsite at Umlalazi. Dunn died in 1895, having married 49 wives (48 of which according to traditional Zulu custom) and fathering over a hundred children (various sources give differing numbers about exactly how many – ranging from 116 to 163!). That same year, a magistrate was appointed at Mtunzini, marking the official birth of the town. Umlalazi Nature Reserve itself was proclaimed in 1948 and today forms the northernmost section of the Siyaya Coastal Park which stretches for 37km along the coastline and also incorporates the Redhill and Amatigulu Nature Reserves. 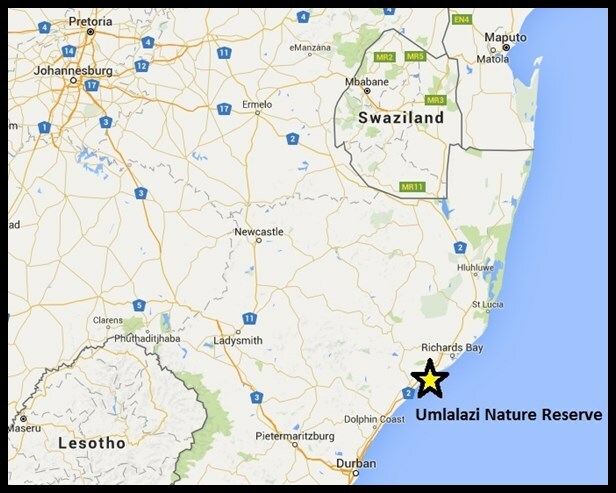 Umlalazi Nature Reserve is located on the Indian Ocean, along Kwazulu-Natal’s North Coast about 140km from Durban (or 700km from Pretoria), and easily accessed from the Mtunzini off-ramp from the N2-highway. This entry was posted in Kwazulu Natal Province and tagged Mtunzini, nature, outdoors, picnic spots, travel, Umlalazi 2016, Umlalazi Nature Reserve, vacation, view sites, wildlife on April 7, 2016 by de Wets Wild. Thanks Maurice! Sadly no hippos – they would have been very numerous in days gone by, but I don’t think the wider, modern-day Mtunzini area would have enough grazing to sustain them now. Dynamite in a small package for sure! Thanks Sylvia! Did you visit Umlalazi? Exactly the kind of small but special place I love. I bet it’s interesting to go out at night looking for critters on the prowl, and bring your macro lens! It certainly brought a smile to our faces, Lois. We wondered where they were when we got up that morning and then to find them waiting to say goodbye at the gate was so special! Definitely worth a visit if you’re ever in the area, Cal! Baie interessant,Dries.Ek het hierdie week egter die onrusbare nuus gehoor dat Ezemvelo se kontrak om die KZN reservate en beskerming van die oseaan nie meer verleng gaan word nie.Hoe interpreteer jy dit en moet ons ongelukkig voel daaroor? Ja-Nee Dina, die politiek agter sulke besluite bly maar duister. Ezemvelo KZN Wildlife, voorheen die Natalse Parkeraad, patrolleer al baie jare KZN se kus en sover ek kon agterkom was daar geen kommer oor die kwaliteit van hul werk nie en meeste kenners en belanghebbendes het met skok op die besluit reageer. Geen van die artikels wat ek gesien het gee eintlik enige tersaaklike redes vir die beeindiging van hul dienste nie. Hul is immers n staatsorganisasie, hoewel onder provinsiale beheer. Nou moet die nasionale departement oorneem met hul karige hulpbronne? Ek dink veral in die oorgangsfase gaan daar n paar skurke deur die net glip. Sover ek egter kan agterkom is hul beheer or die proklameerde reservate in die binneland en langs die kus onder hul bestuur, soos Umlalazi, egter nie in gedrang nie. Sulke besluite laat my altyd dink iemand het iewers ‘n agenda…bv stropery van seebronne soos oesters en haaie vir die Sjinese se haaivindisse.Ek is deesdae baie agterdogtig oor hierdie mense.Ekskuus Dries,ek klink nou negatief,maar hierdie volg ‘n patroon wat ons gereeld sien,waar onwettighede dan ‘n vastrapplek kry. Nee Dina, ek stem heelhartig saam – wanneer n bewaringsorganisie wat wereldwyd as van die bestes gereken word, met n trotste geskiedenis en n bewese suksesresep so skielik en sonder ooglopende gronde die trekpas kry, kan mens nie anders as om te wonder nie. Kan hulle dalk apelleer of hof toe gaan oor die besluit? Ek dink nie ek het al enige reaksie van Ezemvelo KZN Wildlife self gesien, of iets gelees oor wat hul planne is nie. Ek hoop hulle is besig met iets…laat ons intussen positief bly en die natuur saam met jou geniet. Great to hear from you again, Killaval – hope you are well? We originally booked this trip at Umlalazi because we couldn’t get a booking at Cape Vidal, but in future it will be a hard decision which of them to go for first! Looks like another amazing place. I think the Giant Snail picture is my favorite! We were astounded by all there was to see and experience at Umlalazi, Kathy! Thanks Gayle, Umlalazi’s a beautiful place for sure! This is a wonderfully diverse place. I especially like your sunset shot. Thank you Patti! Yes indeed, for a place so small in area there’s an amazing variety at Umlalazi. I laughed after seeing the sign saying “danger crocodiles” then see folks on tubes! Tourists!! Ha ha! While out walking one afternoon I actually found a group of children swimming right behind that exact sign while their parents were picnicking on the bank. They may have been Mtunzini-residents more familiar with the area than me, perhaps they knew how often or not crocodiles are seen at that particular spot. I sincerely hope so, because nile crocodiles are extremely dangerous. Altyd lekker om jou saam te vat AJ! Darem maar n pragtige plek met n groot verskeidenheid plant en dierelewe. Mangrove het ek nog nooit werklik gesien nie. Dit hou vir my so n geheimsinnigheid in. Pill-millipede is n mooi duidelike foto. Die akkedis wat loer is netso mooi. Ek kuier darem altyd te lekker by julle of saam met julle. En ons geniet dit om jou saam te he, Ineke! Daar’s n wonderlike “boardwalk” deur n stukkie van Umlalazi se wortelboommoerasse wat mens n fantastiese blik daarop gee – meer daaroor een van die dae! Aa dankie ek sien uit daarna. That’s a great description, thanks Joan! Onthou jy Umlalazi ook met n glimlag, Aletta? Ek kan dink dat dit nogal angswekkend was Aletta, bosvarke laat nie met hulle mors nie! Thank you Julz! Umlalazi’s zebra-threemanship were a real treat to the visitors, they’re just so relaxed around people!